If you love serving pastry-based delights in your house, but making pastry isn’t your best thing, then Carême Pastry is about to be your new best friend. Their range of ready rolled, all butter pastries raise any recipe to new heights. Carême recently released a world first range of ready rolled spelt pastry – so you can even feel good about the health benefits of your favourite pie or tart! 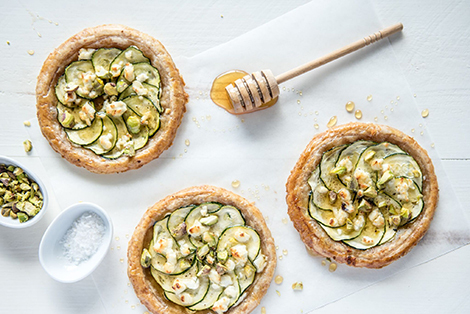 And talking of tarts, the lovely folks at Cêreme Pastry have kindly provided Eat Local SA with this scrumptious recipe for a Zucchini and Goat’s Cheese Honey Tart that has lazy holiday lunch written all over it. Now we’re cooking! This recipe was created by Claire Wood at Carême Pastry. Cut 4 pastry rounds out of the sheet of puff pastry and place on a baking tray lined with baking paper. Using a sharp knife, score a 1cm border around the edge of each pastry round ensuring that you don’t cut all the way through.